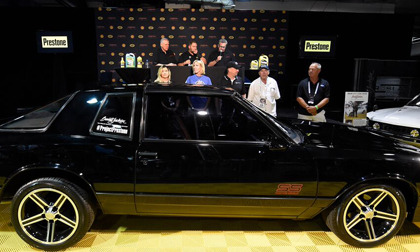 UNCASVILLE, CONN. – June 23, 2017 – Barrett-Jackson and Prestone are teaming up this summer for a one-of-a-kind restoration build named “Project Prestone.” The project car, a 1987 Chevrolet Monte Carlo SS Aero Coupe, was unveiled at a press conference at Mohegan Sun in Connecticut Thursday, along with the restoration plan that will see the completed vehicle auctioned at Barrett-Jackson’s 2018 Scottsdale Auction in January. At the completion of Barrett-Jackson’s 2017 Northeast Auction this week, the vehicle will be transported to Scottsdale, Arizona, and set up within the Barrett-Jackson Collection Showroom, where a majority of the restoration build will take place. Over the summer months, the Showroom Division Manager and team will complete a variety of work on the restoration build that includes replacing and upgrading the stock suspension, brakes and exhaust. The ’87 Monte Carlo SS Aero Coupe will also have a rebuilt transmission, new sound system and graphics package. Prestone and partners of the project will be invited to the Collection Showroom to participate in the restoration build, and Barrett-Jackson will release photos and videos on Barrett-Jackson.com and social media using #ProjectPrestone to document the progress.The restoration build will be completed at the Las Vegas Auction on October 19-21, 2017, and will be on display during the show. The vehicle will also be included at the Prestone trailer display at the SEMA Show in Las Vegas, October 31-November 3, 2017, along with various events in Arizona that Barrett-Jackson will be attending. Outside of its appearances, the Monte Carlo will be stored at the Barrett-Jackson Collection Showroom until it crosses the auction block at the 2018 Scottsdale Auction. Contributing partners helping with the project include Chevrolet Performance Parts, Detroit Speed, Inc., MagnaFlow Performance Exhaust, Summit Racing, Stanley Black & Decker, Mac Tools, Direct-Lift, BFGoodrich, Adam’s Polishes, The Eastwood Company, Lingenfelter Performance Engineering and Wilwood Engineering. Barrett-Jackson’s 2017 Northeast Auction is underway at Mohegan Sun in Connecticut. Follow all the action online and tune in live on Velocity and The Discovery Channel. Complete auction information, including television times and results,is available at Barrett-Jackson.com. Headquartered in Lake Forest, IL, Prestone is the number one branded consumer choice for antifreeze/coolant, brake fluid, and power steering fluid in North America. Prestone manufactures and markets antifreeze/coolant, brake and power steering fluid, windshield washer fluid and other leading vehicle maintenance products. Prestone antifreeze/coolant has protected vehicle cooling systems since 1927. You can find more at www.prestone.com or by following Prestone on social media: www.facebook.com/prestoneofficial, www.twitter.com/prestone or www.instagram.com/prestoneofficial.